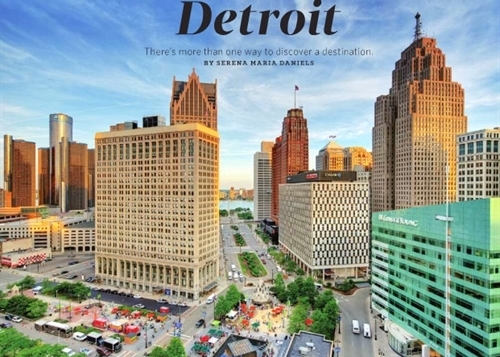 With Miguel Cabrera on the cover, a Mike Duggan interview and three other articles, Delta Air Lines presents news about its MIdwestern hub in this month's in-flight magazine. "Once written off by national media as an aging urban dinosaur wracked by economic despair, corruption and population loss, it now as likely now to be celebrated as a comeback city," Free Press editorial page editor Stephen Henderson writes in the lead article, headlined "Investing in Detroit's Roots." This feature has 25 short items that show "this city is buzzing," as Serena Maria Daniels writes. In a piece spread over parts of six pages, he reports on "some of the people and groups that are promoting long-range growth for the city and its residents." Shouts go to the New Economy Initiative, Skillman Foundation, Dan Gilbert and Shinola. A photo shows Henderson at Hantz Woodlands on the east-side with vice-president Adam Hollier. The real test is for Detroit to change for the majority of people who live there. When will the roughly 675,000 people who live in far-flung neighborhoods -- isolated and beset by poverty, abandonment and blight -- feel the effects of the momentum that's sweeping downtown and Midtown? When will Detroit change for Detroiters? It's a tougher question to ask, let alone answer, than what's found in most national coverage of the city's endeavors. Detroit's deepest problems are found in its neighborhoods, where unemployment, lack of education and isolation dominate the landscape. These problems don't have easy solutions or ready fixes. The work to bring back neighborhoods is gritty, long-range stuff. It requires deliberate, strategic action whose benefits may not materialize for years. . . . It's the kind of toil that will always have to compete for attention with higher-profile glitz about a city that was knocked down hard, is getting back on its knees, learning to crawl and hoping to someday walk or run again. "The Detroit 'brand' is becoming a big thing. Everywhere you look, there are new businesses opening up that have lines of pro-Detroit merchandise with slogans like Detroit Hustles Harder, Nothing Stops Detroit and Pure Detroit." Ahem, what type of merchandise is that again? Who knew there's a need to distinguish the good stuff from anti-Detroit items in stores? "Hero worship can't erase Detroit's economic woes," the Miguel Cabrera profile says, "but it can offer a pleasant, temporary amnesia." A three-page feature by local journalist Serena Maria Daniels presents 25 quick hits that show "this city is buzzing." The former Detroit News reporter (2011-14) lists lodging, dining, sightseeing and nightcap picks for five categories of visitors -- Entrepreneur, Gourmet, Culturalist, Hipster and Eco-Friendly. The array spans attractions as diverse as the Dequindre Cut and Detroit Opera House, and food choices as disparate as Lafayette Coney Island and the London Chop House. In case you wonder, Daniels leaves no obviousness behind. Shinola, Supino, Slows, Avalon and Mercury are all present, as is the obligatory phrase "Detroit booster Phillip Cooley." 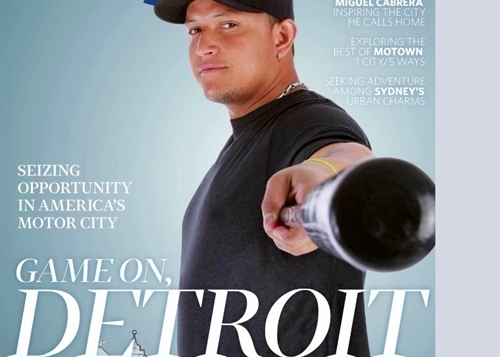 For "Miggy the Magnigficent," a three-page profile, Delta bypasses hometown sportswriters and uses Chris Clayton of St. Paul -- added to the monthly magazine's lineup as a senior writer in June. Hero worship can't erase Detroit's economic woes, but it can offer a pleasant, temporary amnesia. But hey, we're not jeering a national publication with Miggy out front, no way. See the digital magazine's table of contents here. Click on any blurb to reach that article.